Ever been to a Senegalese restaurant? Better yet, in Madrid? 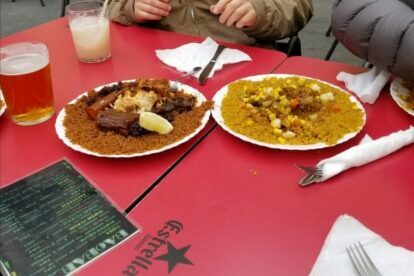 Situated in the heart of the Lavapiés neighborhood of Madrid, Restaurante Baobab offers a small, yet delicious, menu of cuisine from Senegal. The Lavapiés neighborhood is known for its diverse cultures and its amazing and affordable cuisine. The menu at Baobab is small, but in my opinion this makes the experience easier and more efficient as too many choices tend to make eating out difficult (especially with unfamiliar cuisine). Baobab offers a variety of dishes with chicken, meat, fish, vegetables and rice. A combination of different sauces accompany these dishes. The chicken yassa is a huge favorite, which combines chicken, onions, lime juice, vinegar and peanut oil, with rice. The chicken is marinated and slow cooked. If eating in a group, I recommend you order a variety of plates and share so you can get a little taste of everything! With 6-7€ you will leave full and content, even including a beer! Baobab is right across from Plaza Nelson Mandela. During any hour of the day many people gather here to relax, play music, and enjoy the environment. The restaurant is mostly outdoors but seating is available inside. Lunch and dinner hours here are busy so there may be a small wait, but it is worth it!